It’s a perfect time to grab a sweater, sit on the porch and sip on Pear Ginger Mocktail made with just three easily available ingredients and ready in seven minutes. I love the idea of serving easy and delicious welcome drink during any party or get together. It energizes you for the rest of the evening and refreshes you at the same time. Also it’s a bonus if the beverage is healthy and low calorie, indulgence becomes even easier and guilt free. 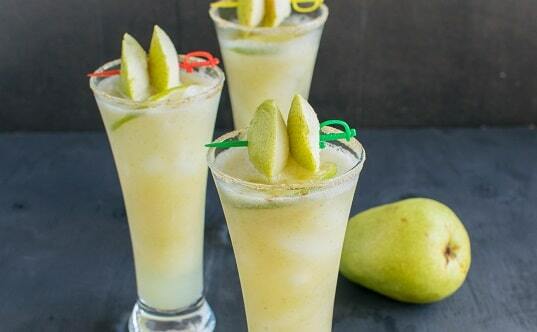 Pear Ginger Mocktail is a quick and nutritious drink for any occasion. Just combine fresh fruit pear, ginger powder and pure coconut water in a blender and blend smooth. For serving rub the rim of the glass with a lime wedge and dip it in the ginger powder for a strong flavor of ginger and attractive presentation. Garnish the drink with fresh lime wedges and relish every sip of it. In a bowl/plate combine 1 tbsp. white sugar and 1 tbsp. ginger powder and shake it well. Rub the rim of your choice of glass with lime wedge. Dip the glass rim into the ginger mixture. Fill the ¾ of the glass with crushed ice. Pour the mocktail into the glass. Garnish with lime wedge and serve immediately. If desired feel free to convert this recipe into cocktail feel free to add little rum/tequila along with the ingredients mentioned.